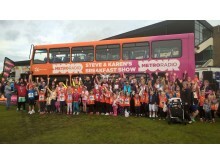 Hundreds of fundraising runners were welcomed at Go North East’s Metro Radio bus as the popular local station held a special broadcast at the North of England Children’s Cancer Research (NECCR) annual fun run last month (May). 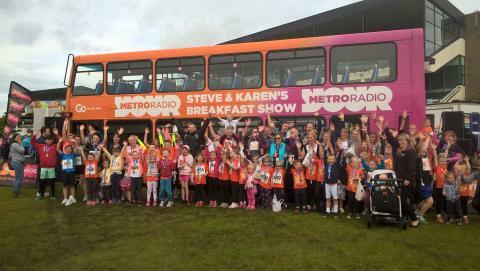 The brightly branded double-decker bus was a focal point for racers of all ages at the event, stationed in the new and improved event village at Newcastle Racecourse at Gosforth Park. Participants ranging from experienced runners to youngsters and families were invited onboard for face-painting and glitter tattoos, while being entertained by Metro Radio hosts. Go North East supports The Children’s Cancer Run each year, which celebrated its 35th anniversary in 2017. The event, organised by NECCR helps to fund research into childhood cancer that has established the region as one of the world leaders in this specialist area. With the help of this year’s fundraising, the total raised throughout the event’s history has now exceeded seven million pounds.